In this Kitchen Nightmares episode, Chef Gordon Ramsay visits Capri, Los Angeles, California, a restaurant run by identical twins Jim and Jeff Thiel. The staff call them overgrown boys, immature and say that they do as little work as possible. They don't open for lunch and only open 5 nights a week to save on wages. Gordon sits down to try the food, the menu is falling apart and the restaurant was dirty. Gordon tastes a meatball sandwich , Chicken Scarpello and the Colossal Pizza. The waitress confesses to Gordon that the restaurant has not been cleaned as Jim is lazy to do it. The meatballs are bought in and microwaved, the pizza is falling apart and Kim can't tell him exactly how old the frozen chicken is. Gordon gets the staff to clean up before the next service. Gordon watches a dinner service and finds the kitchen to be dirty, there are rotten vegetables and warm sauce in the fridge. Lots of dishes get returned and there is a lot more sobbing. Gordon discovers that the chicken isn't being safely defrosted, tells Jim to take it off the menu but instead he announces this to the dining room and the diners walk out. Gordon brands the service lazy and tells Jim and Jeff to clean their kitchen alone. Gordon decides that they need to open for lunch and with help from the staff they open. Jim and Jeff arrive to a full dining room, Gordon had introduced a new simple lunch menu and sits them down to sample it. They make $300 and the twins realise it would boost revenue to open at lunch. Gordon takes the twins to a boxing ring to allow them to get out their frustrations about the restaurant. They box each other and promise better communication. Gordon teaches them to make meatballs and Jim goes out to the street to shout about their meatballs. Overnight the restaurant is transformed and new menus are revealed. On relaunch night the restaurant is packed, Jim is in the kitchen expediting and the food quickly makes its way out the kitchen. Some dishes go out too quickly and are sent out cold. Not long into service that the kitchen starts to fall behind and customers are frustrated. Gordon takes them outside for a pep talk, the kitchen turns it around and the customers love the food. Gordon revisits and they are open for lunch, Jeff controls the front of house and Jim is in the kitchen. Gordon sits down for lunch with the twins and feels under the tables for gum. They report that business is up 20% and Gordon says his pizza is delicious. Gordon has a surprise for them both, it is a certificate of appreciation for their meatballs from the local Chamber of Commerce. Both the Yelp reviews and Trip Advisor reviews after the show are mostly good with a few bad reviews commenting negatively on some dishes and service. In March 2012, they won a poll for the best pizza in Eagle Rock. 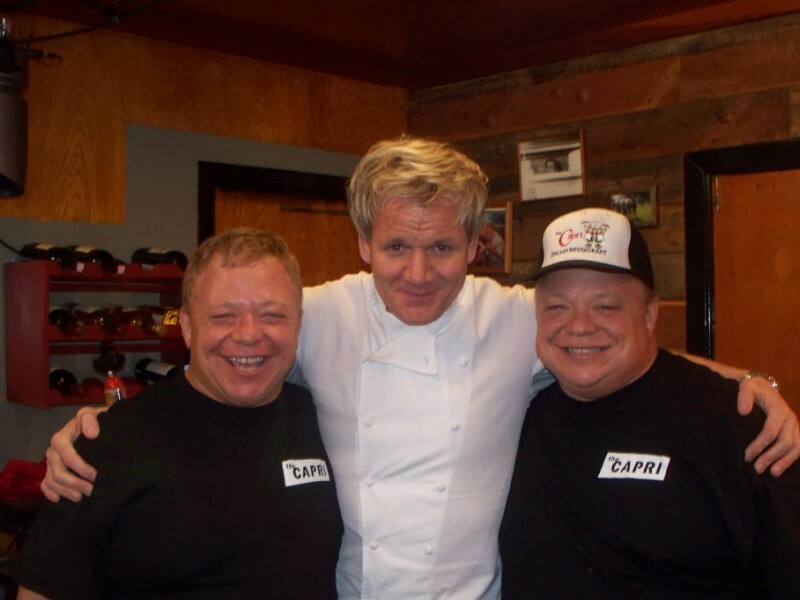 Capri was aired on May 06 2011, the episode was filmed in January 2011 and is Kitchen Nightmares season 4 episode 10. Of all the KN restaurants, I was able to eat at this restaurant. While the food was decent (pizza was good but not the best I've had) and the service was all right, they seem to be doing fine. As I read, the Kingston Cafe across town closed recently, which was surprising since it has been there even before Old Pasadena opened. Holy macro. When I saw the beginning of the episode, it was the first time I'd expect the restaurant to be closed and went to clarify it here. And it stuns me to find out they're open - in a good way. Amazing. Out of all KN this was my favorite episode, I loved these guys, they where funny, you can tell they have a good heart and out of all the owners I wish them the most sucess. Yes. I also agree, I felt that they reminded me of very lovable shire folk and I could see they melted Nodrog's icy heart. Long live Jim and Jeff and God Bless. Hmmm. Quite endearing. A pleasant episode and I shall watch it again sometime. I'm watching the episode as I write this (May, 20 2015) and since I'm planning a trip to So-Cal (Disneyland rocks!) I'm going to have to find out how far the restaurant is from Disney. After all, you can't go without seeing Tweedle-Dee & Tweedle-Dum. That was the first thing that popped into my head when I first saw this episode. And apparently they are actors. Where were they when Tim Burton remade Alice? Loved the movie and these two would have been better than CG characters. I am happy to know that they are open, they seem like decent guys unlike most of the arrogant toerags they get on the show. Loved the boxing match, too! Were these brothers ... um ... "special"? Yes. They are special as a matter of fact, they are beautiful innocent shire folks, never doubt the courage of Hobbits as they have shown. The pair of them very much defeated the Dark Lord Nodrog Yasmar and the world is once again at peace, or should I say peazza? ^ Best, most unexpected response in a blog. I'm glad to see this place open, I think they really seemed dedicated to turning things around and deserve to enjoy their hard work. I wish most success to them. I ate there with my family last weekend. The food is good and the twins are cool. And their happy Hour has an $8 pitcher of beer and one dollar meatball sliders! Interesting (in a good way) owners, good episode. Although they seemed difficult at first, he was able to reach them and get them to see that they would only be helping themselves by taking his advice to heart, and they seemed like decent guys who really cared about each other and about their business. When Gordon was scraping dirt off the stained-glass pendants I wanted to reach into the screen and grab that one bluish-green one with the opalescent finish... it was gorgeous, dusty or not! Yea me too, some of those fixtures were beautiful, but you just know they were unceremoniously tossed in the trash in favour of those ugly stainless steel mixing bowl things. This was one of my all time favorite episodes and one of his most successful turnarounds too. Not only are they still open and doing well, the Yelp on this restaurant is quite impressive. Infact Jeff is pretty active in responding to the Yelpers (not only the positive ones but the negative ones as well, he takes the feedback like a champ). I am definitely planning on visiting this place next time I'm in the greater LA area. Great episode and glad to see two brothers that cared for each other and wanted to turn their lives and business around completely. Cheers! I love seeing people open their eyes and willing to change and run with the opportunity when they see it! And people who care!!!! This is a great show and I'm happy to see this one still open!!! Yehhhhh they are still open. They had nothing to fail cause Ramsay show them a path. he always do only others choose not to follow it (because there heads are so much in there arse). But these 2 man they have done unexpected and even won a prize of best pizza. Now thats something. Its really true to Cook good food u really need good heart. This is a rare episode that I'm rewatching. I usually don't bother seeing they are still open or closed, but I'm happy to see that they are able to keep open in a sustainable rhythm. I certainly wish them the best! Having eaten there, I have to say their pizza is really good. Their style of pizza isn't for everyone, however. The crust is thinner than most American pizzas ala real Italian pizza and had a little more salt than normal, but I still liked it. I also had one of their amazing appetizers, I only wish I had the chance to try more. I managed to speak with them since it was during a slow lunch, and they said they're doing fine, but not great. They're being slightly pressured to open a second location while trying to do things to bring in business like a wine tasting/comedy night. They want to hold off on that though, because they're worried if they open a second location, they'll totally sink. Best episode of the us version. These are guys you actually want to see succeed because they appeared grateful and took the advice to heart. This is the bright spot of the series. This episode made me retch. The gum under the tables, the filthy restaurant, the nasty food and kitchen, and the sweaty twins who served garbage. Truly disgusting. And I do mean I actually gagged whr they were cleaning that gum -- I had to look away. I would never subject myself to that place -- I don't trust the owners not to serve rotten food in dirty conditions. Just watched the revisit since watching the original, very happy to see them doing well i love these guys im from australia i'd go there just to see their cheery faces, i really hope they keep their standards and become the main popular place to eat. Well done! OMG, if he cried ONE MORE TIME!!!! It's not BAD for anyone to cry, at all. But get Jeff together with the crying sister from Yanni's, they'll flood us out! So surprised to see them open! good luck! It's always nice when a restaurant on Kitchen Nightmares succeeds, but I'm especially happy that Capri is still open! The twins seem like fantastic guys, and I'm glad they took Gordon Ramsay's advice; a lot of people don't do that, which is part of the reason so many restaurants on this show fail. The twins just needed a boot in the rear to get them going. It also helps that they have very good staff; often times, I've seen bad staff that are just as bad, if not worse than the owner(s). After seeing one of the twins tasting food from a pot with his bare fingers, I'd never eat there. The restaurant still looks nasty to me. It's 2018 now and I just saw this episode for the first time, I'm on a KN binge. Love the screaming and dramatics with Ramsey and owners, but not with these guys. I think the twins got to him too. It's the least I've heard Gordon use his favorite F#*@ word. First show that has brought tears to my eyes. Hope they still open!!! Really glad to see this one still open with mostly good reviews. You could tell Gordon genuinely wanted to sort the issues out for these two and who wouldn't..?